If you would like to learn more about cookies, please read our Cookies Policy. Below you are asked to set your preferences for cookies. For the required turnover only bets not exceeding the stake amount of 25 Euro per bet count. Minimum odd 2.0 Multiple bets are counted twice. Only the first played bet on a match/event is considered for the required turnover. Bets with bonus money are not considered. 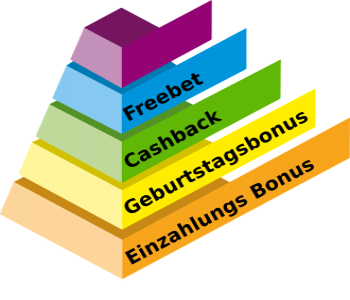 Activation of the point "Receive offers and Bonuses based on my preferences and activity" in your betting-account. For the calculation of the cashback all bets (pre-match and live) are considered. At least one deposit not related to a bonus promotion has to be done. turnover of the bonus within a week. The weekly raffle takes place on Firday. There will be 10 free bets. No payout in previous 30 days before the deposit. Deposit amount must be turned over at least once fully. The bonus amount must be turned over at least 3 times with a minimum odd of 1.5 within one month. Users with an account balance of 500 Euro or more can not receive this deposit bonus. Vierklee reserves the right to terminate this bonus at any time, change the rules or exclude customers from this promotion without stating reason.